To offer you a truly great lunch and maintain our ethical approach to cooking and providing. We do this by bringing together the best local food ingredients, cook them to well-thought-out recipes, use local suppliers, recycle and help those in need. 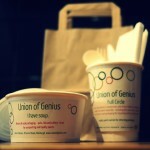 Receive free soup when you use your own soup container or return your takeaway packaging. Your loyalty points build up each time you reuse or recycle and you can have a free soup or add it to our Suspended Soup board to provide someone in need with a meal. All of our take-out packaging and cutlery is made from plant starch by Vegware. If you drop our packaging in a landfill bin after you’ve eaten your soup, then that’s a waste of good packaging, because compostable materials don’t degrade under landfill conditions. All our kitchen waste is composted and we add your returned packaging to our composting. 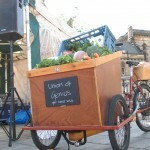 We supply a number of cafes across Edinburgh with our soup and salads and keep delivery carbon neutral thanks to our cargo bike - which itself was recycled from old bikes. Making our deliveries by bike courier means we can continue our environmentally conscious ethos which is so important to us. What does Union of Genius mean? Composting carried out via the Edinburgh Cyrenians CORE programme. We believe that soup is an amazing food. To us it's love in a bowl. It comforts, nourishes and sustains. 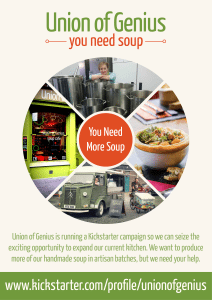 Here at Union of Genius we put the same attention to quality, freshness, flavour and detail into every single serving of soup.